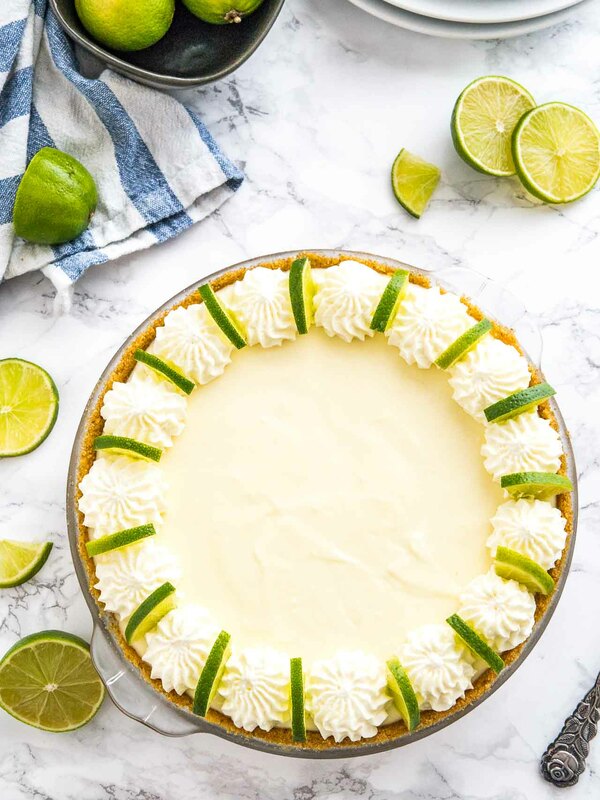 No Bake Key Lime Pie is a delicious, easy summer dessert made with only a few, simple ingredients! An easy-to-prep NO-BAKE lime cake recipe that is perfect for when you just CANNOT turn your oven on in the summertime. 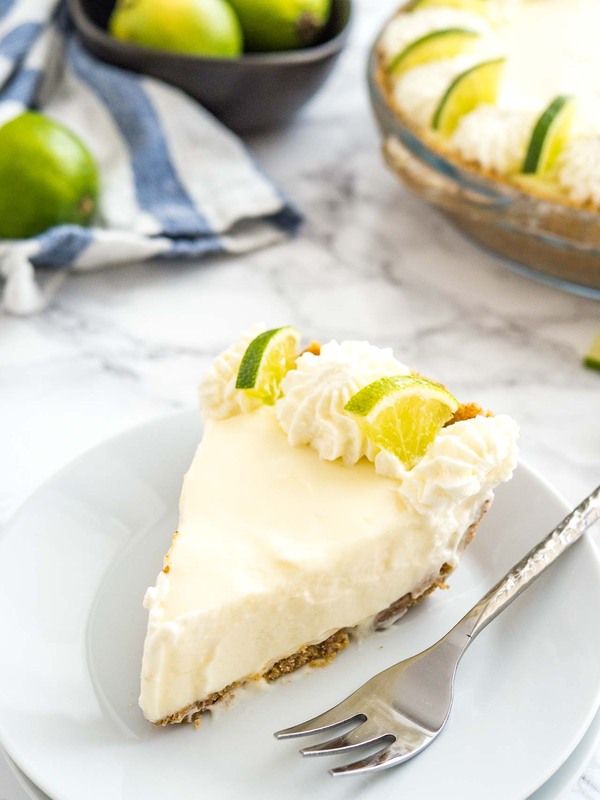 No Bake Key Lime Pie is one of my favorite summer desserts! It requires only a few ingredients and is simple to throw together in minutes. You’ll want to keep this easy no bake recipe on file for summer parties for sure! I love that I can make this Key Lime Cream Pie several days in advance and store it in the freezer. Perfect for parties when you have to prep many dishes! I just let the pie thaw for about 20 minutes to return to its perfect creamy texture, garnish it with fresh whipped cream, and serve it. Who doesn’t love a cold, refreshing dessert on a hot summer day?! 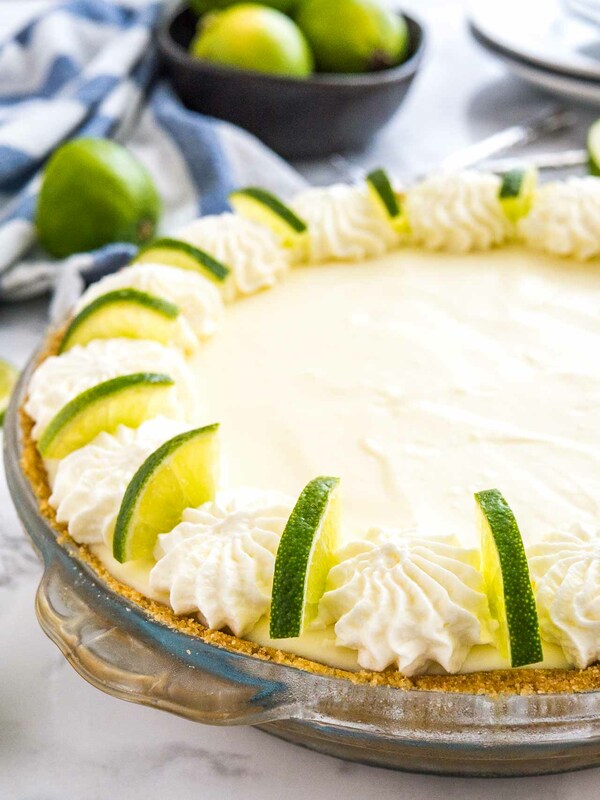 Whipped Key Lime Pie is perfect when you don’t want to turn the oven on! It’s cold, creamy, and so delicious. 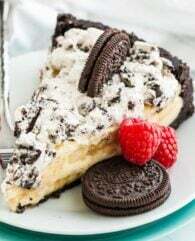 A perfect summer dessert! Freshly squeezed key lime juice is obviously the best choice for this recipe! But you will need about 20 key limes to get 1/2 cup of juice. You can also use bottled key lime juice or the freshly squeezed juice of 4-6 ‘regular’ limes. 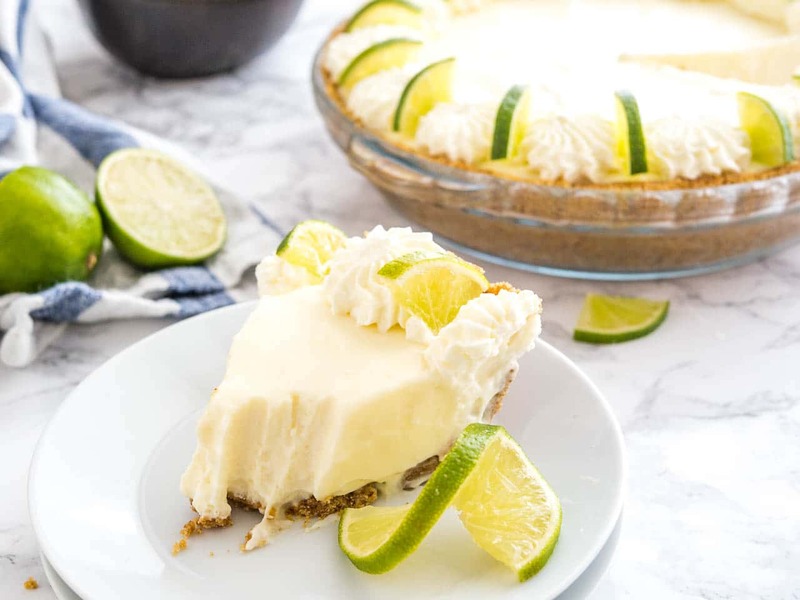 I promise this lime pie will taste great even without key limes! You can add 2 tsp finely grated lime zest to the filling if you like the texture in the filling. Use organic limes that are not waxed or treated with chemicals, the treated ones taste bitter. You can also make this recipe in a 7 or 8-inch springform pan. I find it easier to make pretty slices when I use a springform pan. Make sure to press the crumb mixture up the sides of the springform pan. To make this recipe even easier, use a prepared 9-inch graham cracker pie crust. If you can’t find graham crackers you can also use the same amount of digestive biscuits (UK) or Vollkorn-Butterkekse (Germany). Short cut: This recipe also works if you don’t whip the heavy cream first. Just add the liquid heavy cream in step 5. I prefer to whip it first when I use a springform pan because the chilled pie seems to hold its shape better when the cream was whipped first especially on hot days. 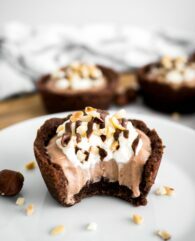 Looking for more No Bake Dessert Recipes? 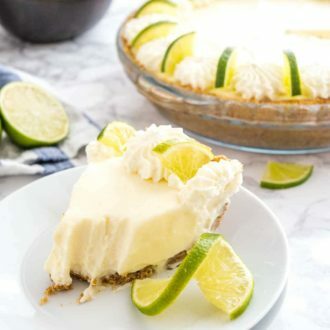 Easy Lemon Cream Pie Recipe: A creamy and smooth lemon no bake dessert similar to this Lime Pie. 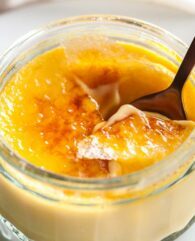 Easy Lemon Curd Mousse: You only need 3 INGREDIENTS for this flavorful Lemon Curd Mousse! Chocolate Mousse Cake: This recipe is every chocolate lover’s dream! No Bake Oreo Cheesecake Parfaits: A no bake cheesecake dessert served in individual glasses. This one is 100% Key lime juice with no preservatives and always gets great reviews! is my go-to pie dish for guests. Springform Pan: This 7-inch springform pan is perfect for this pie and all kinds of cheesecakes! It also fits into the Instant Pot. : This is my favorite tool to zest citrus fruits and to finely grate parmesan cheese! It’s super sharp and easy to clean. : If you have problems with whipping cream try using a hand mixer. I prefer to use this one instead of my stand mixer to whip cream because I have more control and don’t overwhip the cream. In a medium bowl combine graham cracker crumbs, melted butter, and sugar. Stir until combined then press tightly into the bottom and up the sides of a 9-inch pie dish. Chill the crust for 30 minutes or longer. In the bowl of a stand mixer fitted with the whisk attachment whip up the heavy cream until stiff, then transfer to a bowl and set aside. In the same bowl of a stand mixer fitted with the paddle attachment beat mascarpone cheese (or cream cheese) at low-medium speed until smooth, about 1 minute. Add the sweetened condensed milk slowly then beat until smooth and well mixed. Add the whipped cream and mix until combined. Slowly add the key lime juice to the mixture while beating at low-medium speed. The mixture will start to thicken and to get creamy. Pour into prepared pie dish and refrigerate for about 4 hours or overnight until firm. Garnish as desired (I used whipped cream and lime slices). Store leftovers in the refrigerator for up to 3 days. I think it’s funny that you used pictures of Persian lime slices rather than key limes. Key limes are yellow when ripe, so they are not as photogenic! My husband’s people are conchs (from Key West) and use only the juice and milk. It’s tart! In the old days they could not get cream cheese. This pie set up just fine; I was hoping for something more tart. If I added 3/4 cup lime juice would it still set up? I don’t think that would work but you could add some lemon extract. Thank you Julia, so nice to get some feedback. Actually the next day, the pie was plenty tart! Everyone loved it. :) I’m making it again for Easter. In our house we use a premade crust, 1 can sweetened condensed milk, 1/2 cup of lime juice and a can of whipped cream. Takes about 5 minutes. I keep the can of milk in the frig so its already cold. Don’t know how long it keeps because it gets eaten immediately!!! We just use the juice ov 3 limes and don t measure. When you store it overnight in the fridge, do you cover it with foil or Saran Wrap? I cover the springform pan with plastic wrap. It doesn’t touch the pie because I leave the ring of the springform pan attached. Too much trouble….Just read the instructions on the back of the key lime bottle and mix key lime juice with sweetened condensed milk and 3 egg yolks. Stir with a spoon until mixed and bake in crust for 15 min. at 350. Cool 10 min. and refrigerate. Top with whipped cream. Yummy!! The whole idea here is that it’s the no bake version! Would it work just as well with a pre-made graham cracker crust and cool whip? A Pre-Made Graham Cracker crust would work for sure but I’m not sure about the cool whip because I haven’t tested this recipe with cool whip. Let me know if it works if you try it! It does work with cool whip. I also use a half can of frozen limeade or lemonade. I use can of sweetened condensed milk, 8oz of cool whip and 1/2 can of frozen limeade but it never seems to set (or get stiff). Any advise please!?? Could this be made in a springform pan for a little more heigh? Or is the filling too soft? You could use a springform pan if you also press the crumb mixture up the sides and refrigerate overnight so the mixture really sets. 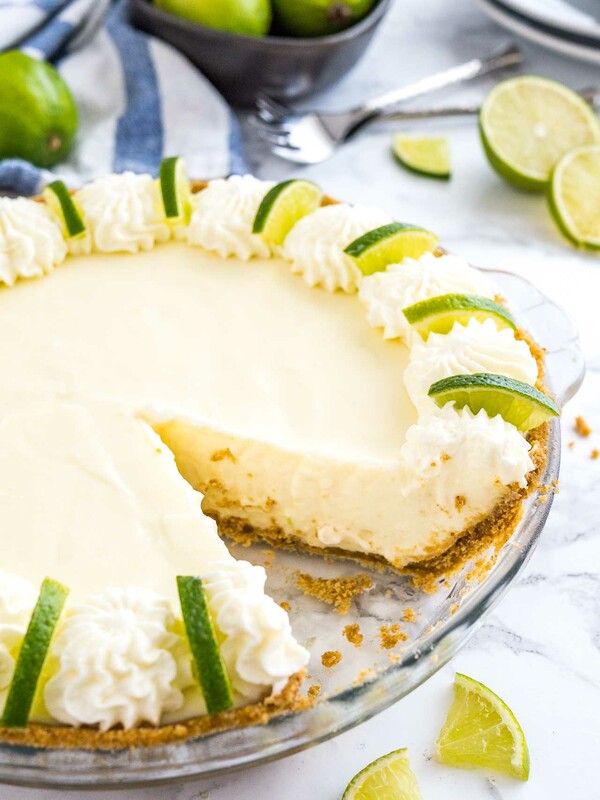 The absolutley best key lime pie recipe & so easy to make! Used mascarpone not cream cheese. My daughter said it’s like eating a cloud. Don’t wait for summertime — we made it for Thanksgiving!! Only tip is don’t keep it out of the fridge too long as it does soften. But right out of the fridge — perfection!